Encyclopedia is an ecological work featuring digital and physical content. The core of the work is a text generator that creates encyclopedic entries for extinct fictive animal species. These unique entries are given away as one-off printed index cards to visitors of the exhibition. Encyclopedia aims to put a gentle focus on the state of the planet, meanwhile exploring the possibilites of digital literature and art. The textual presentations of each animal shift between matter-of-fact descriptions of habitat and feeding habits, and more poetic sentences on the characteristics of the species and its surroundings. 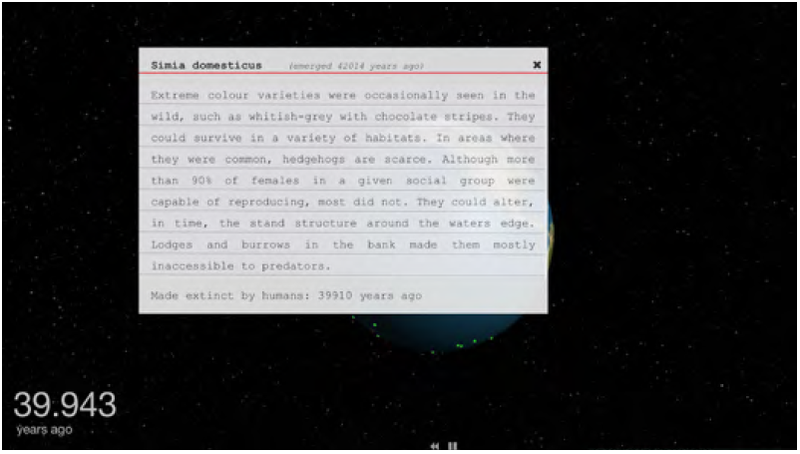 The generator analyzes text content and additional data from EoL.org (Encyclopedia of Life), which has comprehensive information on a huge amount of species, extinct and still living. It then outputs an encyclopedic entry derived from the data, creating a fictive animal species, starting (and simultaneously ending) a new track in evolution. Each entry is unique, never to be repeated. One of the key parameters in the generator is Conservation status (as of the IUCN red list): in each micro-narrative every species is already extinct at the moment of creation – every entry ends with a description on how the animal was driven to extinction by humanity, through varying factors such as pollution, poaching, deforestation, climate change and more. This theme is mirrored in the presentation of the work, in its temporal representation: the text presentation of the generated animal is impossible to replicate. It becomes a personal, intimate message to the person on the receiving end – this species is now yours to keep, only ever existing in these few lines of text. Hopefully this will also make an ecological statement on how we view and treat this planet.